What Is Actually On My Head? Your hair is “dead”. Actually, the hair you see, which is called the hair shaft, is dead. As it is made up of the protein called keratin. Even though we understand our hair as being lifeless, there is much life that happens under your scalp! We will explain simply, the fundamentals of how hair grows. Hopefully, allowing you to better understand this more-than-just-appearance-like characteristic of both males and females. At the base of the follicle is the papilla containing capillaries (tiny blood vessels that nourish cells). The very bottom part around the papilla is called the bulb. The cells of the bulb divide every 23 to 72 hours. Surprisingly, faster than any other cell in the body – and you thought your hair was dead! The medulla is right in the middle of the hair shaft, acting as a lifeline. 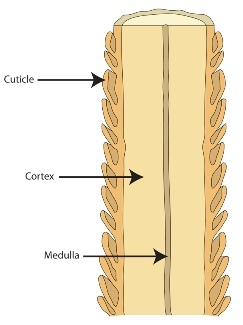 The cortex makes up the majority of the hair shaft by giving your hair its width and colour. The cuticle is the protective outer layer made-up of overlapping scales (sometimes well illustrated in hair care commercials). Do not be so shocked at how much you shed! This is a natural occurrence for humans, being quite random, opposed to other mammals with seasonal shedding patterns. You may shed anywhere from 50-100 hairs per day. 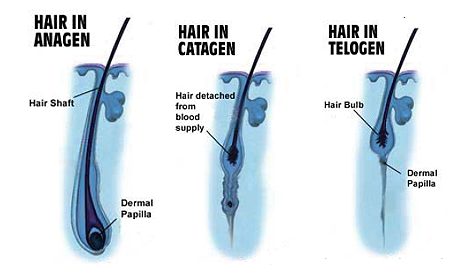 There are three stages of growth and shedding: anagen, catagen, and telogen. Not all your hair is in one of these stages at the same time. Sometimes your Hair Stylist will use these terms for you to better understand your hair process, often, when it comes to colouring or highlighting. Never be afraid to ask what exactly he or she mean by, “penetrating the cuticle”! (A short form answer: the cuticle must be opened for permanent colour to be depoosited).